Yep. This is something we specially know about. Check our logo and the XIX century image that our logo was designed from. 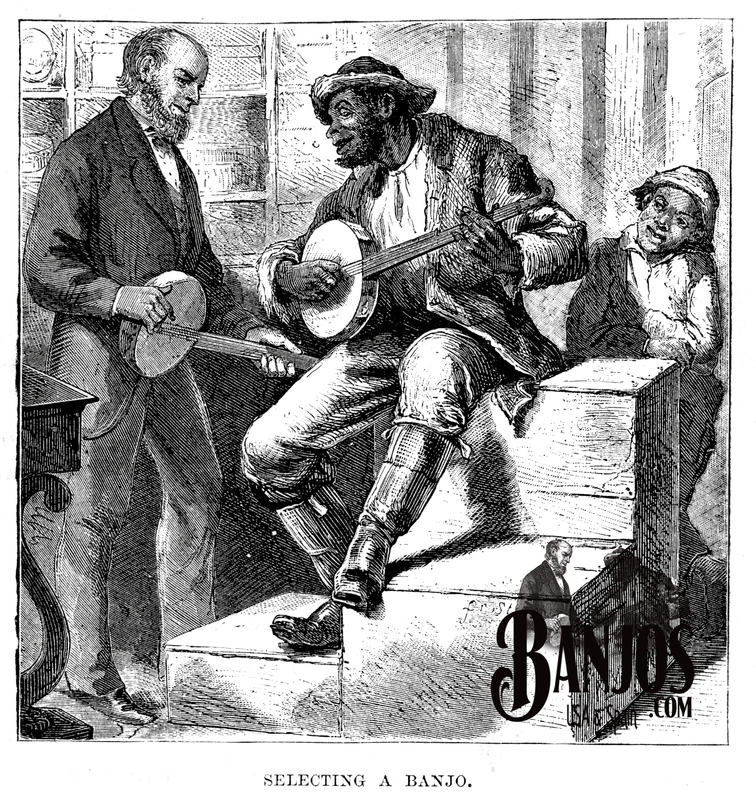 It shows a musical instrument seller advising on choosing a banjo to his customer. The drawing is, in fact, titled “selecting a banjo”. We chose it for its vintage appearance and the powerful message it brings from American banjo origins. The drawing is made in Richmond, Virginia, in 1882. Anyway, when choosing a banjo we first need to think of the style we want to play or inspires us. Are you influenced by Earl Scruggs or any sort of bluegrass music? Then you may better point your purchase to a resonator banjo (wood closed back) that will give your banjo that extra resonance, brightness and projection required. Maybe you prefer the plunky tone of Old Tyme music? Openback banjos (without the wood resonator attached) will not have that sound projection but will fit perfectly your needs. Open-backs are often fitted with pickups when the player needs this extra volume to play to audiences. The resonator is 99,9% of times attached to the banjo with 4 thumbscrews. So in case you ever need a mellower tone or less volume, it may easily be removed to create an openback banjo. String action refers to how high strings are above the fingerboard. In my personal opinion, when buying a banjo for a first time (I mean, specially for the first time) we need to make sure action is low. Not that low that strings will buzz when playing with some volume, but the lowest we can have without the strings touching on frets when played. There are not many things as frustrating as high strings for the beginner´s fingers, making it really hard for strings to be well fretted and get clean notes from our new banjo. Both brands we carry (Gold Tone and Deering) are awesome in string action no matter if we talk about beginners or pro-model banjos. Run away from cheap Asian manufacture. In the Pacific Rim countries, they are not stupid. They know how to create a good sounding banjo (specially when trained to do so) and know how to build a good looking, but cheap and useless one to sell and hang on the wall. Make sure you buy from brands that want you to really play the banjo, and want you back to buy from them a better one instead of selling you a wall hanger instrument. Gold Tone makes banjos abroad, but these are designed and set up in the USA, making fine playable instruments. Cheap manufacture will be often easily seen in the resonator at a quick glance. Low quality copies will have a full metal resonator without wood rim. Full metal resonator is a trick that cheap banjo builders mount to get close to real banjo sound, but never will reach the real thing. This matter is pretty personal to the buyer. Simply know that quality beginner banjos can be bought from 350$ up to 600$. So the choice is mostly personal on how much you want to spend. Try voiding spending less than this, as you´ll be probably buying a cheap manufacture that we discussed above. Most reputable brands will offer models in this price range that will let you start playing and have a useful banjo for years until you feel you want to step up.